With the arrival of winter and the first drops of rain, indoor activities play a major role in the guests’ visit, and so museums become one of the most searched attractions. Chosen by our Concierge these museums are the ones that truly tell Lisbon and Portugal’s history through art. Museu do Chiado or Museu Nacional de Arte Contemporânea features the collection of Portuguese art from 1850 to the present, making it the most important collection of Portuguese contemporary art including painting, sculpture, drawing, video and other media. Museu Nacional dos Coches is Portugal ’s most visited museum. Made in Portugal, Italy, France, Austria and Spain, the coaches cover three centuries and range from simple to sophisticate. 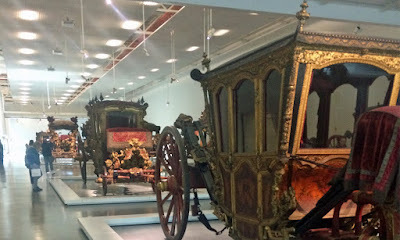 The main gallery in the style of Louis XVI, is occupied by two rows of coaches built for the Portuguese royalty. Museu Nacional de Arte Antiga is located in a XVII century palace built for the Counts of Alvor, named the Palace of Alvor-Pombal, the museum contains the largest collection of paintings, with emphasis on the religious works of Portuguese artists. Most of the parts came from convents and monasteries after the suppression of religious orders in 1834. Museu Calouste Gulbenkian is located at the Calouste Gulbenkian Foundation in Lisbon. Its collection consists of about six thousand pieces of ancient and modern art, of which only one thousand and thirty are displayed to the public.